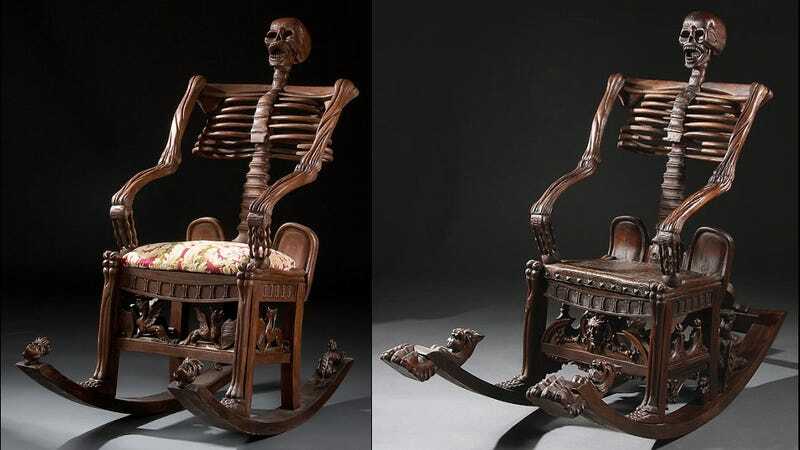 These rather grim-looking rocking chairs look like they belong to the Addams family, but they're expertly carved antiques worth a few thousand dollars. Continental 20th century. Depicting the skeleton figure of seated form on rockers terminating with carved busts. Probably modeled after the mid 19th century Russian example as illustrated in 19th century European furniture by Christopher Payne. Height 54 inches. Estimate $2,500-$3,500. The one of the left actually sold for $3,120.00.